We are pleased to announce, we have recently been certified to the ISO 13485-2016 standard, an internationally recognized quality system standard, signifying the Quality system at CAM Bioceramics, which ensures processes are in place to address quality system aspects related to medical devices. 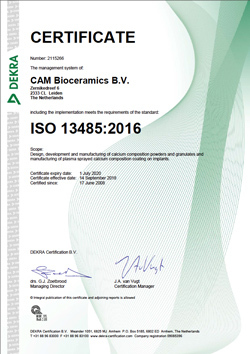 This ISO 13485 upgrade shows CAM Bioceramics’ commitment to providing agreed levels of quality care and patient safety to the development and manufacturing of calcium composition powders and granulates, and the same high level of conduct in our business practices. CAM recognizes this achievement would not have been possible without the dedication of its employees and their efforts in ensuring quality and providing the best possible calcium phosphate products and services to our clients.